There's something happening just across the water. Following an incredibly successful outing at the Gay Games in Paris last year, the team behind Team Ireland are developing plans to build on that success to work on LGBTI issues in sport. LEAP Sports, along with our colleagues at Pride Sports, joined Sporting Pride Ireland in Dublin this weekend to share some of our own learning and experiences with them. The meeting was attended by representatives from Sport Ireland, the Ministry of Sport and the Ministry of Justice of Ireland. A clear momentum with a palpable sense of energy was evident amongst a diverse, passionate and skilled group of LGBTIQ+ community members keen to see progress being made. Hugh Torrance presented on what LEAP Sports has learned charting the journey from its inception in 2010, to becoming established as a charity in 2012 through to present day. LEAP Sports has been collaborating with groups and organisations across Europe for the last few years and it's a priviledge to be supporting one of our celtic cousins and closest neighbours to develop LGBTIQ+ sport and their sporting community. Speaking on behalf of the new organising group, Philippa Ryder commented, 'Sporting PRIDE is looking forward to using the ideas and suggestions from the weekend to improve participation in sports within the LGBTI community in Ireland. The experiences from how LEAP Sports Scotland was started had an impact on the government agencies who were at the meeting and hopefully this will lead to Sporting Pride becoming a sustainable national organisation'. Reflecting on the meeting, Pride Sports Director Lou Englefield said "Recent insight from England shows that LGBTIQ+ sports activity thrives in areas where support for clubs & groups exists. 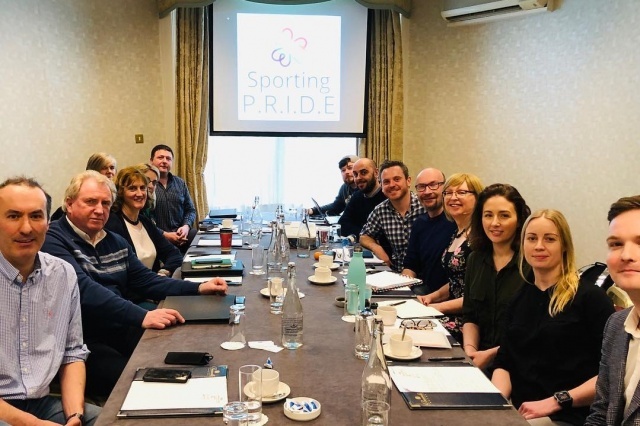 It was exciting to be part of discussions with Sporting Pride Ireland, to share experience from Pride Sports and see the potential for the growth of LGBTIQ+ sport across Ireland"
Written on 21st January 2019.